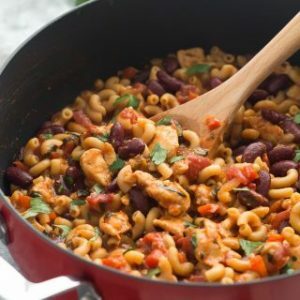 This One Pot BBQ Chicken Chili Mac is the perfect meal in one! It’s loaded with protein, fiber, veggies and made in one skillet in 30 minutes! An easy, healthy weeknight meal. First, I feel like I need to apologize. I did kind of drop the ball on these 30 Minute Thursdays at the end of 2016, what with me being buried under holiday cookies, cakes and cheesecakes and all, but I am back, and I’m hoping to stick with it! Because who doesn’t love a 30 minute meal? 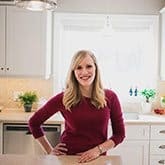 I love these 30 Minute Thursdays because it forces me to get creative and adds yet another easy, healthy meal to my repertoire — something our family needs plenty of! I was really stuck this month though. Maybe because my brain is still all holiday cookies. Maybe because I took quite a bit of time off of recipe development and the creative juices just aren’t flowing yet. 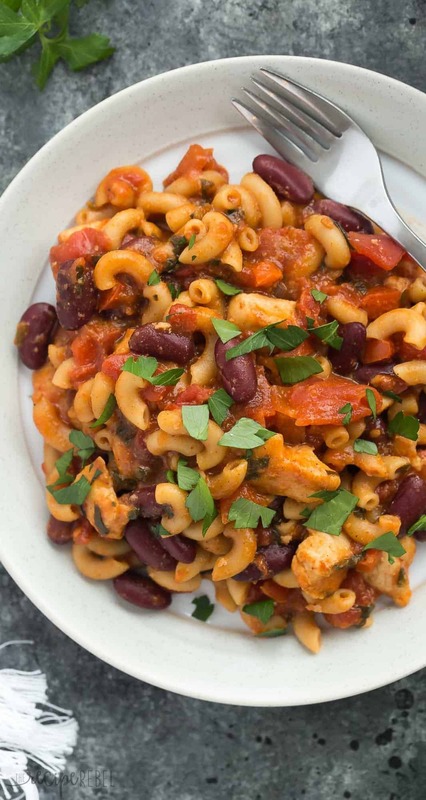 This Slow Cooker BBQ Chicken Chili Mac. 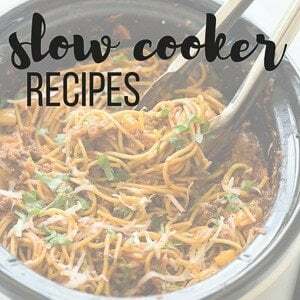 It is one of our all-time favorite recipes here on the blog, but I think I’m the only one that makes it! 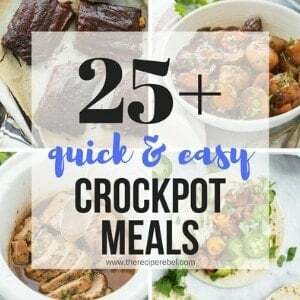 I figured it was time to bring it back to life in a quick, simple one pot meal kind of way. And I’m not mad about it! I love meals like this because it’s so easy to load them up with veggies. I like to add shredded carrots or zucchini, and chopped peppers, spinach, or kale, to dishes like this with a ton of flavor because if there’s someone in your family who isn’t a fan of their veggies (*raises hand sheepishly*), the chili flavors mask them easily. You’re still getting all of the benefits of eating your vegetables without really realizing that you are — perfect for those picky eaters! 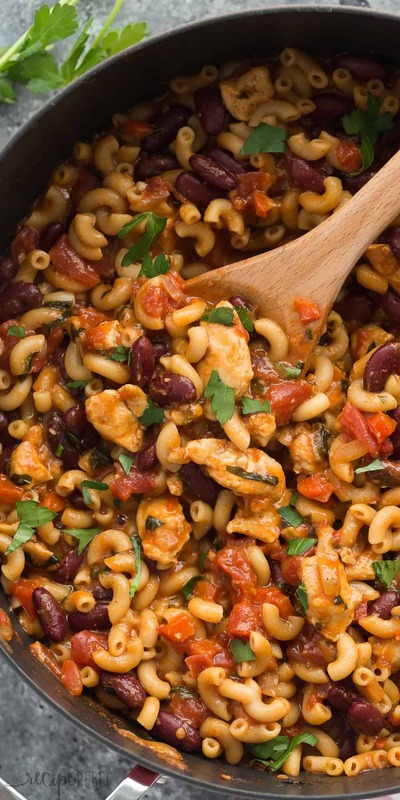 This One Pot BBQ Chicken Chili Mac is the perfect meal in one! 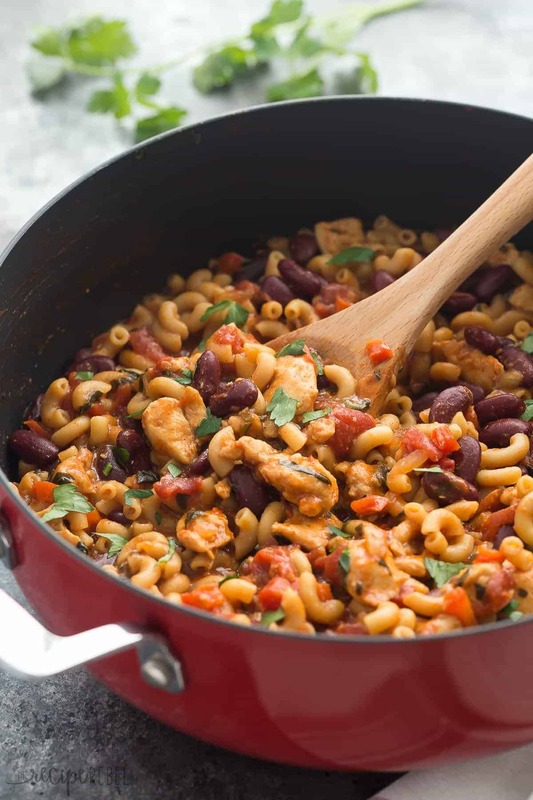 It's loaded with protein, fiber, veggies and made in one skillet in 30 minutes! An easy, healthy weeknight meal. In a large skillet over high heat, cook chicken breasts in canola oil until browned, about 2-3 minutes. Sprinkle with seasoning salt. Meanwhile, chop your red pepper, onion and spinach and add to the pan. Cook over high heat, stirring often, until softened, about 3-4 minutes. Add beans, garlic and chili powder and cook 1 minute. Add tomatoes, barbecue sauce, broth, salt and macaroni and bring to a boil over high heat. Reduce heat to medium and cook until pasta is al dente and liquid is mostly absorbed, about 9-10 minutes, stirring often. Stir in cheese (will continue to thicken as it sits and the cheese melts). Serve. I made this for dinner tonight and we loved it! It was super easy and the perfect comfort food after a long day at work. I can’t wait to eat the leftovers for lunch tomorrow! I am so happy to hear that Kristine! 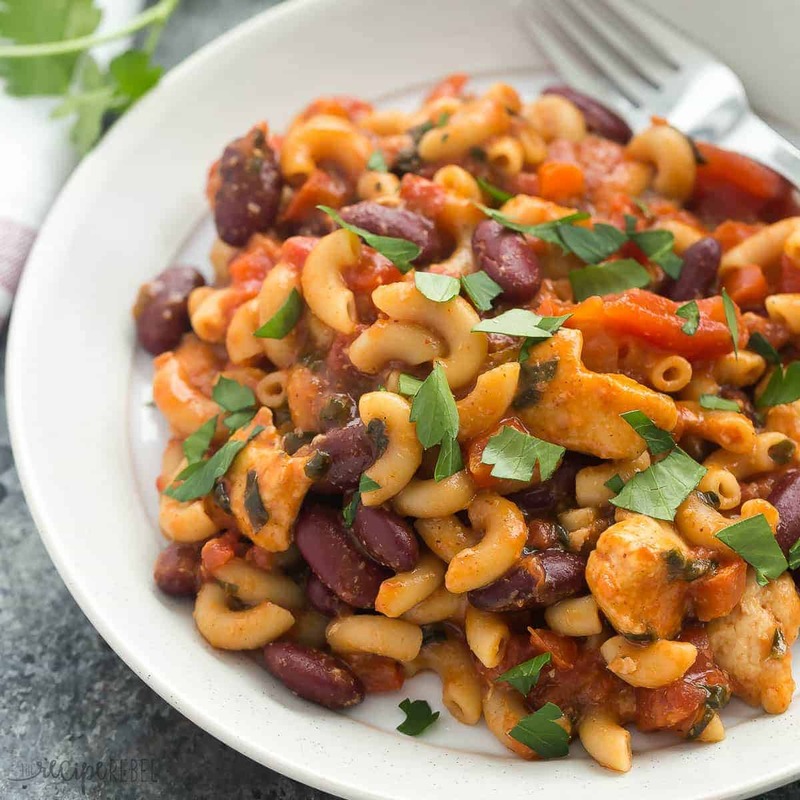 We just love our one pot pastas! I used to think noodles and beans were strange together but then I tried them and it is so good!! I could pretty much eat anything that has chili in it! I agree, sometimes it’s so hard to think of a 30 minute recipe but so nice to have a new one to try! I made this today for a cold winter day in Michigan. Loved it. Also loved the fact that it is loaded with protein. Thank you for sharing. Thanks Linda! I’m glad you enjoyed it! I was bad about 30 minute Thursdays at the end of last year too — I had a lot of sponsored work and was worn too thin. It’s nice to be back and I love this dish! Such great flavors and I know this would be a hit with my boys. Can’t wait to try it! Thanks Marcie! I feel like most people were drowning under Christmas baking and didn’t cook as much — but I’m excited to be back at it! Yeah this looks so good, Ashley! I can see what it’s a favorite of your. Some of my favorite recipes on the blog get zero attention, so it’s nice to bring them back around (even if in a slightly different form!) once in a while. I’m a big fan of BBQ flavors, so I know I’m going to love this! Happy New Year! Thanks Liz! I think I need to do it more often — sometimes I hardly get around to making my personal favorites again! Thanks Sarah! It’s one of our favorites! 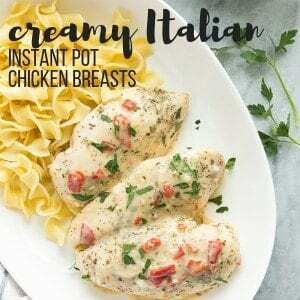 Mmm one pot pastas are my favorite! Definitely my perfect version of comfort food. I’m loving the bbq chicken flavor in here, Ashley! Especially since it’s all ready in just 30 minutes. Just what I need for busy weeknights!